Editor’ note: This is an interesting article from a reader & contributor. When searching for a job, security is often the last thing people think about. 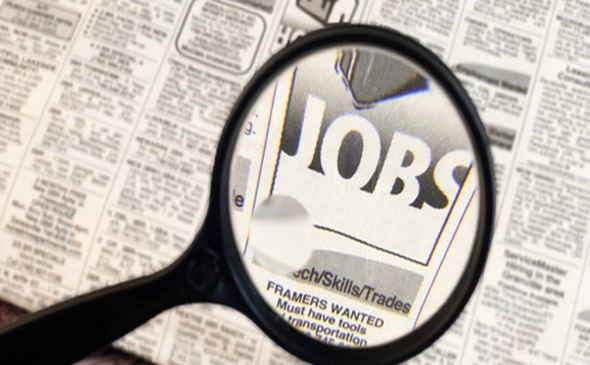 But there are some security pitfalls that every job seeker should be aware of. As a job seeker, you owe it to yourself to do your “Due Diligence.” This article is one job seeker’s thoughts on protecting yourself during a job search and practical tips to avoid being a victim of identity theft or fraud. I recently started looking for a job once again. Not due to a situation of not having one right now and needing to find something quick so that my bills will be paid on time, but to do something new and interesting. Then the thought hit me: I’m really glad I have the time to look around, do some research and choose wisely. I know I have been in the “hurry up and get a job” situation before and have experienced how being in a haste can lead to some not so good decision making. I know this has been me in my earlier job hunting days when I was still a green little seed waiting to sprout. Even though people I know have had to look for work time and time again, it’s a little shocking to find out the amount of people who don’t seem to know how to protect themselves while looking for work online. So, I developed a list of tips to help protect fellow employment seekers from opening themselves up to the possibility of some discouraging situations. –Make sure there is a company name listed in the ad. This one seems like a no brainer but truth is, I have noticed myself actually responding to well-structured job postings without even checking to see who I am applying to. Needless to say, I never received a call back and whoever was on the receiving end now has my name, phone number, email, resume and who knows what else. When someone has this type of personal information this can lead to identity theft and various types of fraud. Even if the job posting is completely legit, how serious can the Human Resources department be if they won’t even mention who they are? This also opens up the door and allows you to exercise another tip mentioned in this list. –If one is provided, take the time to pick up the phone and call the number in the post to actually talk to a live person. Ask them any questions that come to mind. I like to ask them if they are hiring for an open position to check if the ad matches what their answer is. Just make sure they are appropriate for the level you’re at in the process of being hired (Don’t ask them what uniform you should wear before you get hired). Also, don’t forget to take the name and title down of the person who answered and make a note of the day, date and time you called for future reference should you need it. –Take the time to look up reviews online about the place. What are their previous customers saying about them and their service? Sometimes a review will mention an Owner or Manager that is currently still there. Their review might impact your decision about possibly working there. You can also visit their own website to see what hints you can get about the work environment. I like to take note of the layout and how easy or difficult it is to browse as well as how much or how little information is provided. If you can’t seem to find anything online about the company, it may not exist. –If hunting on a website that allows for anyone to post publicly, such as Craigslist, it’s best to be wearier of sending them an email. I don’t like the only contact method being email since I have no other way of contacting them and the email address you see is not their actual email address so you have no way of knowing who you’re actually sending information to. I know that some employers keep a stash of resumes sent to them that stand out and discard the other less thought out ones. This helps them keep a pool of prospects with almost no effort to call on should somebody quit or get fired. I have seen this happen several times in my work life. Note: I’m not saying DON’T reply to postings with only an email address for contact, use common sense and think it through. We don’t all get the luxury of laid back job searches. –This is another tip from my personal stash. I like to set up an email address specifically for sending information online. Should you send your email address to the wrong person, you don’t have to worry about embarrassing emails, pictures, or private information. This serves as your fail safe in case you reply to a scammers ad regardless of how much precaution you took. This might seem like overkill to some but it’s likely they have never been through a security breach. I only use this one for such purposes or those annoying clerks that “can’t continue without one” at the checkout stand. We don’t hate you, we hate the policy. –A good alternative to the anyone-can-post websites is one where employers looking to post a help wanted ad is checked for authenticity. Websites like these might require you set up a profile online but don’t charge. At least not the ones I have used in the past, I do believe some websites might charge you. Having a profile should allow you to save postings you are interested in, upload a resume for easy sending, change your settings or show you only positions you are interested in or qualify for. Going through a legitimate site will increase and hopefully ensure that you are dealing with the real deal. –Make sure there is a job description included somewhere in the body of the job posting. Almost every company or business looking to effectively communicate a positon to the public will have one. One of my jobs has a higher turnover rate than I had originally thought and when I see one of their job postings there is no job description included. Only a generic title and sometimes a very brief summary that barely qualifies as one but they do include the location and method to apply. –Don’t send out all of your information with a resume right away. I like to ask them a few questions and mention beforehand that I am looking to replace one job or maybe both and would like to know what the schedule would look like if not mentioned in the ad. I like to let them know that I know they are busy and want to see if this would be a possibility for me before I waste my time and theirs making it to the interview process only to find out that their hours won’t work out for me. Ask them about anything that would be a deal breaker for you like having to commute to other locations or be on call. Mention that you are security conscious and don’t like to send personal information until you know you are actually interested. This also allows you to make sure you are dealing with an actual business and they might even appreciate you being considerate enough to work with you through any problem you might have if you’re the right candidate. –Look into the laws against discriminatory practices like what an employer can and can’t ask you when deciding if they should hire you. If you see any number of shady requests or inappropriate questions in their ad, it raises the likelihood that it’s a fake. Legitimate employers should (hopefully) know what is and isn’t allowed to be asked of you during the employment process. If an ad tells you to send them your social security number along with all of your contact info, stay away from the reply button. Is the employer too eager to hire you? –If an employer is a little too eager to hire you without going through some sort of vetting process like an interview or submitting a resume, it can be more likely that they are hoping someone feels a little too eager about getting hired. They might be counting on you to submit whatever information is requested by them or might be hoping to lure you into starting right away at some private location where your personal security can be compromised. If you have to pay – run away . . . fast! –There probably aren’t very many legitimate employment opportunities that require you to pay them before they pay you or even hire you. Take note and report job postings that ask you to set up direct deposit prior to signing anything with them in person and going through the interview process and other steps. I replied to an ad once that asked me to take a payment from them prior to my labor. As I hope you would, I refused. To wrap it all up, I really hope that everybody takes the time to question any job posting they are considering replying to. 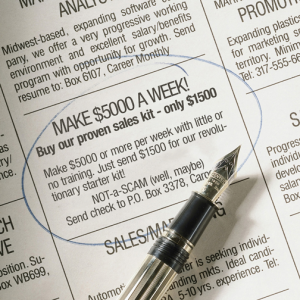 This is the key to spotting a potentially harmful scam disguised as a job posting. Where is the job location? What is the name of the company? How come I can only get in touch with them through this generic email address? What is the job description? Why has nobody contacted me or answered my email? Why do they never pick up the phone and how come it always asks me to leave a message? These are only some of the questions that can help you distinguish between a real or fake help wanted ad. These tips are simply a summary of what it is I do to make sure I raise the probability of finding my next employment adventure online safely, and to the best of my ability, under my control. Perhaps the best tip I can give my readers is to think independently and question yourself about what it is that should be included in an online job posting. These tips have been adopted by me through experience and questioning either myself or my peers. Who knows? You might even have a few pointers to add to this list after some thoughtful consideration.